If you recall my earlier posts of the World Health Organization/Pan-American Health Organization headquarters building, I like architectural abstracts. These are some color abstracts I shot on two different excursions – one down to the National Mall at sunset, and the other on my routine walk home from work. 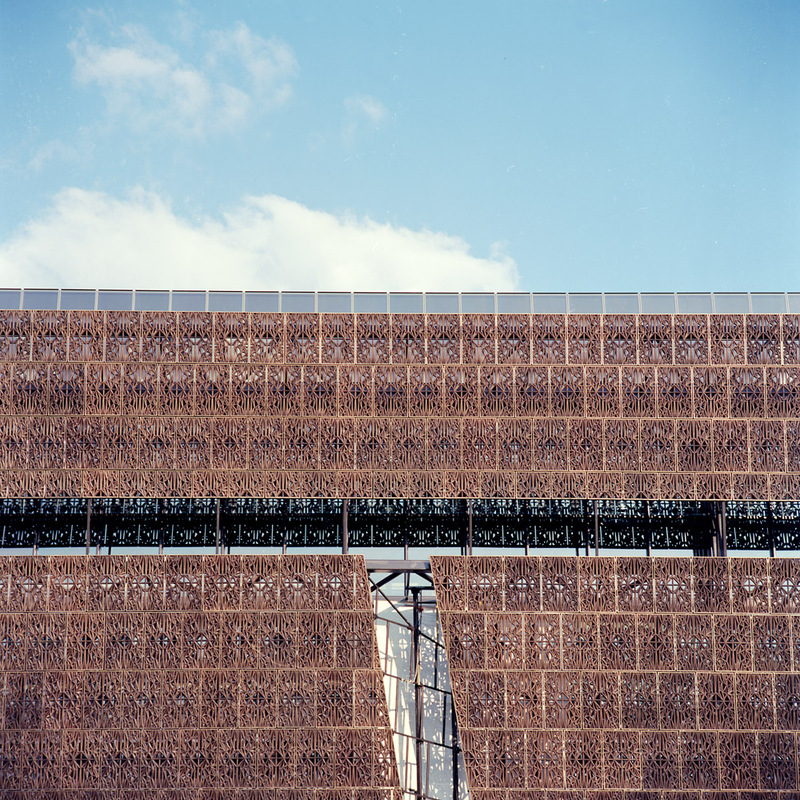 The African-American History museum is still a work in progress – I think it is slated to open in 2016, but it could be 2017 or even 2018 before it is ready for visitors, even if the structure is finished (which it appears will be true sometime this year, from the look of it). 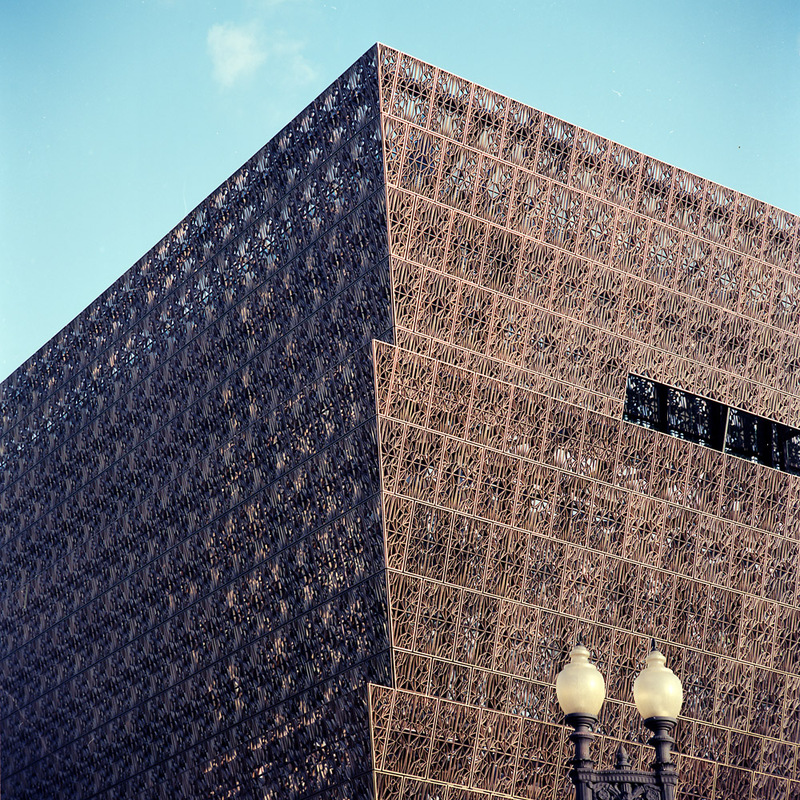 The building design is made to look like a traditional African crown with three tiers of bronze-colored mesh. The repeating pattern of the mesh screening lends itself extremely well to abstraction, and the missing panels (from the architectural renderings on the signs outside the museum, they are in fact missing/uninstalled, and not intentionally empty) add a geometric counterpoint. It’s nice to see that DC is finally getting some real architectural gems, and is not just filled with Classical-revival, Victorian, and Modern Industrial glass boxes. On a certain level it’s too bad the Corcoran was not able to get their financial act together several years ago and build the Frank Gehry addition to the school they wanted, as that would have been quite a striking change to the streetscape. 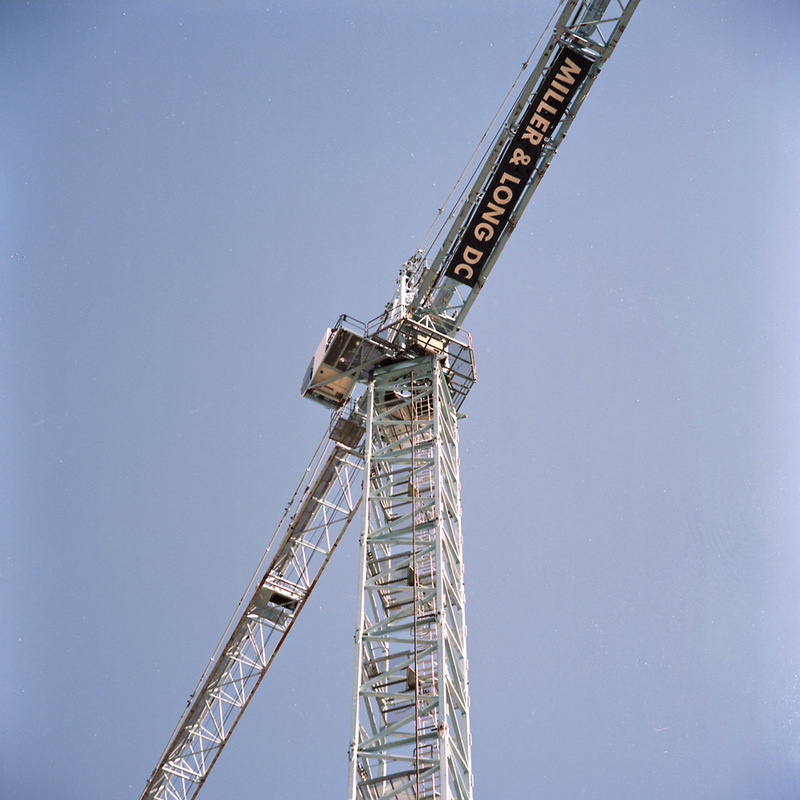 Although not strictly architectural, I thought the geometric forms of the crane against the solid blue sky made for a nice abstract and fit well with the overall theme; after all, it is a construction crane. Far be it for me to accuse George Washington University of being architecturally avant-garde; most of their buildings blend in to the DC streetscape with an ennui-inducing banality. But their 1970s and 1980s brown-brick boxes do have some worthwhile details that break the monotony and catch the eye. Take this stairwell, for instance – the walls are blue, which pops out against the brown brick facade and dark bronze-color window trimming. 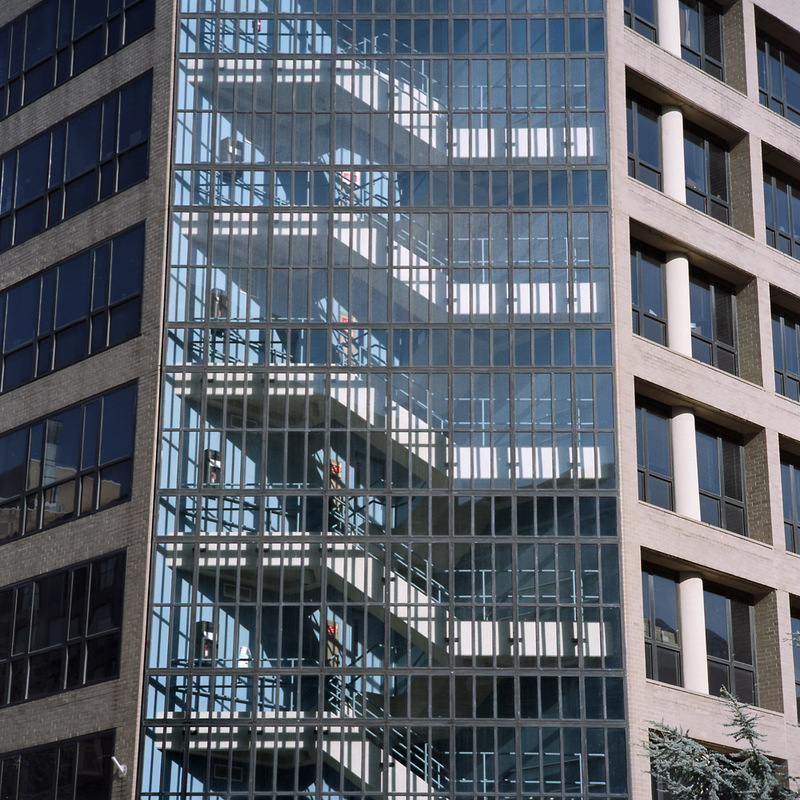 And easily overlooked, the blue stairwell provides some continuity by breaking the space between the facades, each of which has a different styling for their windows. Without the stairwell, the contrast would be in high relief, and we’d think something went wrong during construction and/or they ran out of money and had to switch styles when they turned the corner. 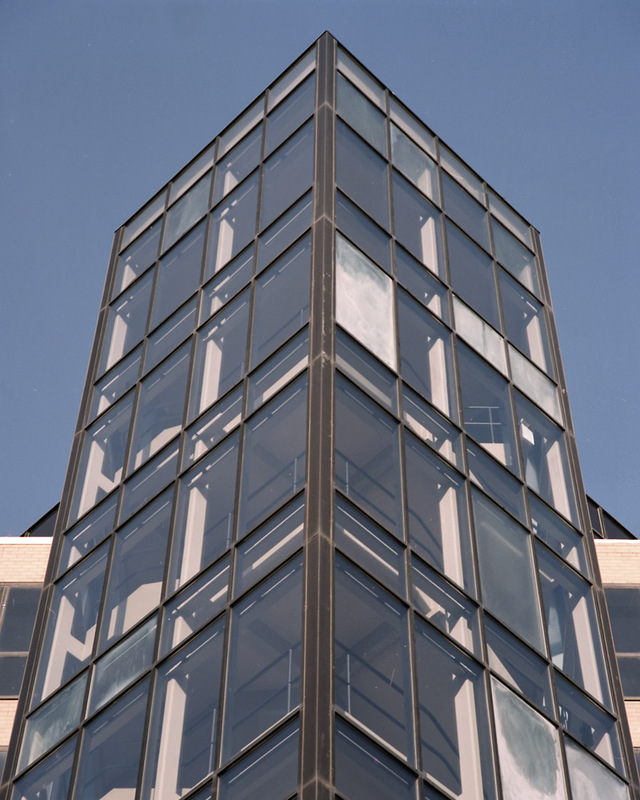 This glass tower thrusts into the sky like the prow of an ocean liner, cleaving the plane of the facade like an Arctic icebreaker clearing the channel into Archangelsk through a wall of sea ice (ok, I’m being a tad dramatic but I wanted SOMETHING to say about it).